Founded in 2006, Jive Communications Inc. (888-925-2547) offers efficient hosted communication solutions at the enterprise level. This service provider has taken to the cloud with its Jive Core cloud-based platform that runs all the services it offers. Being a cloud-based provider allows Jive to offer powerful, economical and effective solutions to its customers. Despite offering enterprise level VoIP services, the company perfectly caters to the public sector as well as small businesses that want to use the power of the cloud to bring their phone system to the next level. The VoIP phone system Jive offers is fully-managed, meaning that you as the customer don’t have to worry about adjusting any of the settings to run this advanced and cost effective service. Those wishing to customize their phone experience can easily do so through the easy to use backpanel. 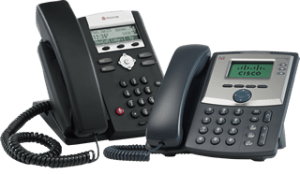 All of the basic VoIP features that any organization needs such as call logs, virtual extensions, ring groups, intercoms, customizable schedules and more are present in the software. Any Jive plan lets you make unlimited local and long distance calls within the US, with inbound toll-free phone calls priced at just 1.9¢ per minute. Businesses that often make international calls can count on affordable rates based on a per-country basis. Scalable: The whole PBX service infrastructure is scalable, meaning that it can be scaled up or down to suit the requirements of the organization. Caller ID and Voice Mails: Identifying the callers is now a breeze, thanks to caller ID facilities. Call Routing: Using existing data networks, incoming or outgoing calls can be routed to the proper destination, without the need for setting up a dedicated infrastructure. Online PBX Controls: With the right credentials, a security or maintenance personnel can easily control the entire PBX service from anywhere over the Internet. Call Queuing and Speed Dial: Having to resolve multiple simultaneous calls is no more a pain, with the call queuing systems in place. Similarly, reaching a regular contact is also easy with the speed-dial facility, just like the regular telephone. Online Fax: Since the VoIP service runs over the internet, FAX services can also be offered with VoIP, and Jive does that quite well. Reports and Logs: Monitoring the PBX solution is now easy, thanks to the activity logging and report generation features that Jive offers with its solutions. Call Forwarding/Recording/Transferring: Two of the most essential features in every telephone today; call forwarding and transferring allow active conversation to be transferred to another personnel or department at just the mere click of a button. 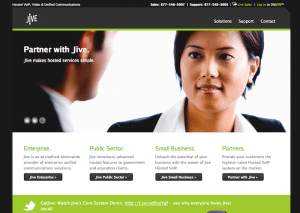 With so many features available, the VoIP services Jive Communications provides are numerous. The service provides a feeling of having used a regular telephonic line, which makes the whole experience a pleasant and memorable one. With several splendid features on offer, the services are quite easy to use. For those who find it difficult or complicating to understand, Jive offers a number of video guides on their site that help clear the basics. While the actual plans are not exactly available on the site, Jive Communications offers VoIP services at a lower pricing point than legacy communication systems. This usually translates to a lower cost of ownership for the organization in the long run. Call Jive on 888-925-2547 to request more information and a free custom quote for your new VoIP system. It’s recommended to know the amount of phones/users, phone numbers when requesting your quote, as well as the name of your current phone provider. Apart from the mail support and on-phone support on 888-925-2547, there are also live chat options on the website for both customers and potential clients alike. Dedicated resource personnel are on-board to attend calls and offer effective solutions to the clients. There is also an online portal that helps solve issues that the customers may be facing; the service can be accessed by just filling up a basic form online. I’ve already been through RingCentral and Vonage. There are key features that are critical to doing business such as a good desktop app that can act as a communications control center. Jive’s is absolute garbage. It is meant only for inter-company monitoring of phone usage. The thing is it’s dealing with the customers that are important. Being able to see who’s calling in, listend to voice mail messages, see faxes coming in, etc. None of this is available with Jive. Both RC & V had this. RC used to have an excellent desktop app but discontinued it and forced a beta that was terrible on all their customers. The original app could do everything mentioned above and send faxes, listen to vm’s being left while being left and allow me to pick up the call (call screening) drag and drop voicemails and faxes into files and emails and lots more. If RC hadn’t dropped theirs, I might still be with them. The rest of their service was fraught with problems. As it is now, to see needed things like voicemails and call logs, you have to log into a portal that takes more time, has a higher learning curve and covers up too much of the screen. Believe me, there’s nothing like having a smaller good communications control center where you can do almost everything that is only on the top right of the screen and pops to the front of everything with an incoming call that tells you who is calling and you can decide right there what you want to do with the call. Absolutely none of these features are available on Jive. This app is useless for helping me do business with my customers. They are trying to build their own app but god knows how long until anything would be available. Jive needs to license a 3rd party app, preferably the old RC app until they get theirs up to some functional usefulness. They won’t do anything unless enough people request it so I ask that anybody reading this review request jive find a good 3rd party app until theirs is well developed. Oh and their fax is weak. they recommend sending no more than 4-5 pages and tell me that faxes could take 5 min to an hour to make it to the client. That is next to useless. Too many customers can be weak on technology, particularly older and only use faxes or have to wait for their kids to get home to help them with email. Contracts and reports are often much more than this, much more. Many government offices won’t use email because they can be hacked and require faxes to send them documents. Jive says I should accept this because it’s a free service. They may not have a separate charge for it but they are charging in their other fees. No business does anything at a loss. Again, they should make their fax more robust and efficient or license a 3rd party fax service that can handle the workload. Another bad thing about their fax, it works via email. It is cumbersome. You have to remember all sorts of information to put into the send to and subject. If your fax needs a cover sheet you still have to attach it. you have to attach these to the email and send the email that is very limited in what it can handle and can take as much as an hour to send to your client or receive. It would be better set up to have a functional desk top app where you click on a fax icon and just fill in a cover sheet, attach whatever you need to attached and send and one that works faster. Failing having it available in the app, at least have this in one of their portals. If you send the email with a message the recipient will never receive it, only the attachments are faxed. Jive is like so many other tech companies, including RC and Vonage. They make it convenient for them and forget what their customers need. They will consider your ideas and suggestions but only if enough other requests come in. Jive has the telephone basics right and seem like a good company but one that needs a lot of improvement to be truly functional for real business use. They’re worth a try but among the first things you should do with them is request the implement 3rd party fax and desktop apps until they get their own up to a level of usability. On the great side of Jive, their tech support is 24/7/365, lacking in other providers, and their support so far has been great. Their pricing is more reasonable. But how important is the pricing if it’s lacking too much in other key areas? Just to be clear, I will never go back to Ring Central, their service and support are terrible. I’m not a big fan of Vonage either. If Jive can become more functional, initially by deploying 3rd party desktop app and a more robust 3rd party fax service, they have a lot of potential. Everyone I’ve spoken to there is awesome, particularly in support. The more people who ask for these improvements, the more likely they are to request them. Ask them to find the Ring Central desktop app that RC no longer uses and if they deploy it, you’ll love it. I believe if enough of us ask for it, they’ll get it for us. Oh, and they also force us to use the Google Chrome Browser. I’m a fan of neither Google who saves all our information nor of the Chrome browser. Again, a tech company making things easy for themselves, not caring about what their customers want or need. They should be able to work with all browsers.